After overcoming the first set of obstacles. We decided to camp for the night. This is the site of Echo an old mining town. 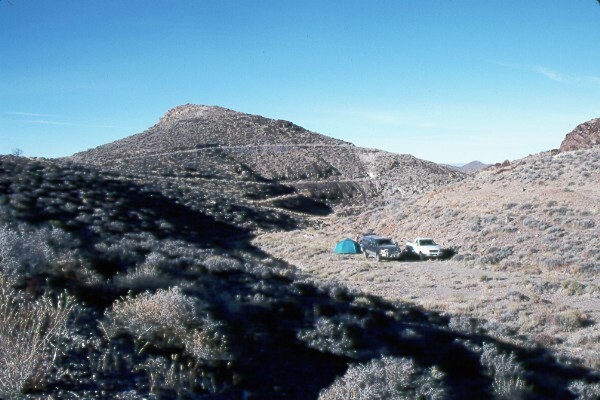 Numerous trails, stone walls and mine openings surround this great place to camp. As usual there's plenty of old mine equipment lying around. 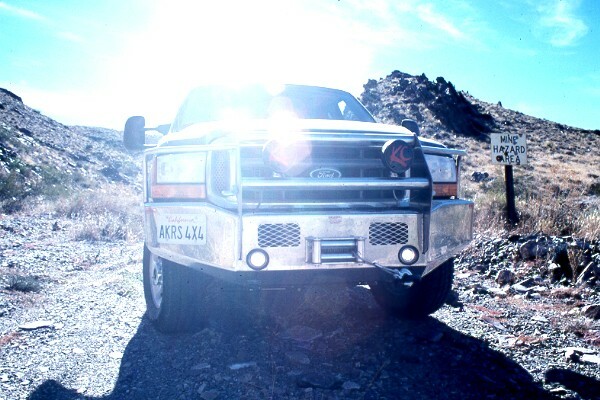 We headed toward Nevada.........well down and east. 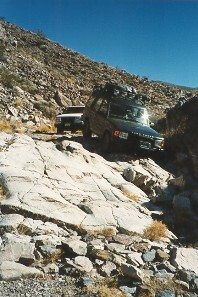 The guide book describes 2 routes across the mountains. It claims the southern most is completely blocked. So naturally we went south!. After 20 minutes of uncomfortable travel we arrived at the 'blockage'. After about another hour of retracing our path, the GPS says that we have successfully bypassed the above dry fall. Indeed, a road joins the trail from our right, and on looking back, we can see the fall. The 'north' road joins the 'fall' road just to the right of the 'Mine Hazard Area' sign (below). 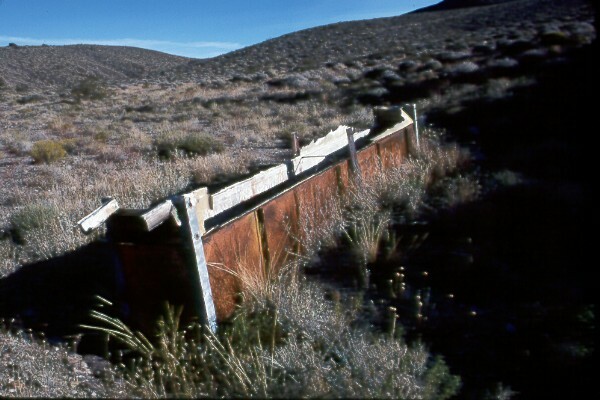 Great!, from here on it should be easy running to Nevada and the ghost town of Lee. 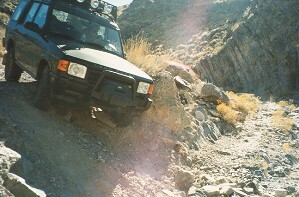 The trail now drops into the bottom of a canyon and gets rougher and rougher, severely off camber and tight. After a few hundred yards, we get out and scout the trail ahead. This is no place to get stuck and have to back out. After another 50 yards, the trail stops completely. A flash flood (or El Nino) has washed the trail away, leaving a 5-6 foot drop off. There's no way down. There are signs that someone has attempted to come 'up' the trail but their wheel marks stop in the face of the dirt embankment. There's not even a way to winch up, the face is too steep. So we have to backtrack and go down the first obstacle we'd come up the previous day. What can I say. Going up the dry fall was easier then going down it. 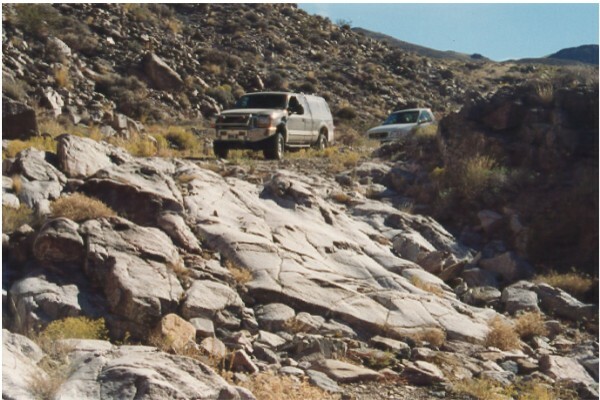 Firstly the entrance to the rockstep involved a very sharp right turn (to get the wheels square to the rock step). After numerous attempts, I finally get the F250 straight, but put a pretty good sized bump in the right hand running board (good job the nerf bars are on the way). 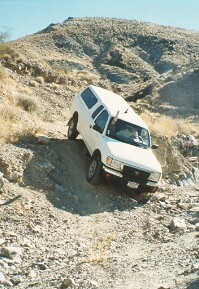 Susan makes it down taking a good 'smack' to the underside of her rear bumper as she drops off the rockstep. 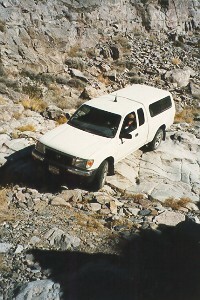 Later we find that her front-end alignment has suffered at the bottom of the dry fall (it can wait to be fixed back at home). So back down the canyon and lunch at Furnace Creek. Ken and Darren made a visit to this trail over Thanksgiving '98. 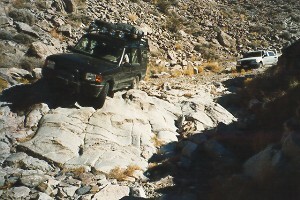 They thought we were crazy to attempt the trail in full-size rigs. Here's a few pictures of them making it over the large rock ledge above and the 'drop off'. Ken tried the line above, but needed Darren to pull him back up to level ground. A better line was found on the far side of the ledge. Ken finds the better line down the ledge. Darren in the Toyota, makes it all look too easy (as usual). 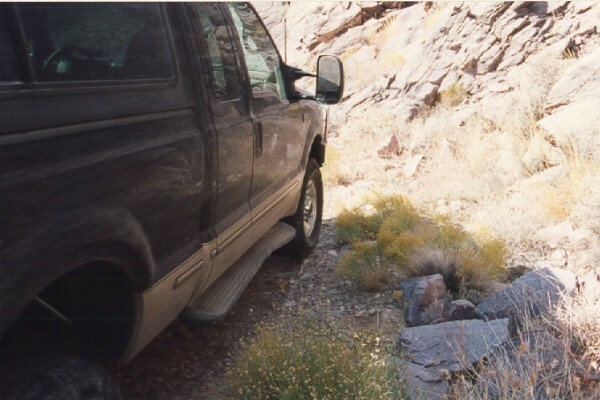 The moral for this trail is "short wheel base or lots of clearance". Here's Darren at the 'drop off'. When we were here there was no dirt ramp, just a cut and vertical drop off.